Growing up as a child, art was the only way I knew how to conceive images and meanings. I naturally found peace when I physically produced visual images to each of my father's stories. With nothing but wooden sticks and a dirt floor as my canvas, my imagination went to work. My very first piece of art was an elephant. And from there as each story visually came alive in my imagination, so did the dirt canvas in my parent's hut. I knew then I wanted to be an artist. To celebrate Asian Heritage Month, the Augsburg Asian Student Association has invited Seexeng Lee '97 to share an exploration of the Hmong identity through his creative work. Lee is a nationally recognized artist and educator who currently teaches in the Minneapolis Public Schools. Lee graduated from Augsburg College with a degree in studio art and secondary education. He has been teaching art in Minneapolis for 11 years and currently teaches at Patrick Henry High School. Lee's presentation is intended to help the Augsburg community learn more about the Hmong culture and their struggles from the past, present, and future to adapting to the American way of life. He will explain how he expresses his identity and seeks to preserve his culture through art. His recent commissions include "Immigration Emotions," a 20-foot mural for the city of Wadena and "Convergence," a signature sculpture for the atrium of the North Point Health and Wellness Center. 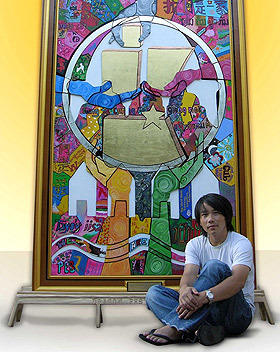 He received a Cultural STAR Grant to create "Unity in Diversity," a relief painting that was unveiled at the 2007 Dragon Festival. He recently completed a 24-foot community art project called "One as We are One." This mural consists of 644 individual tiles painted by members the Hmong Cultural and Language Summer Camp. There will be a drawing for prizes including of one of Lee's 24k gold leaf giclee prints and 2 t-shirts.